Designed for maximum warmth, the R5 Yulex Mitts keep your hands comfortable in the most extreme cold; built from 7mm 85% Yulex natural rubber/15% synthetic rubber by polymer content, with 100% external seam sealing and a fast-drying inverted microgrid lining. Made in a Fair Trade Certified facility. Suggested water temperatures: 32–38° F/0–3° C.
Made of ultrawarm 7mm 85% natural rubber/15% synthetic rubber by polymer content, the Patagonia R5 Yulex 7mm Mitten Gloves are designed for comfort and dexterity in the most frigid surf conditions. With a warm, fast-drying 95% polyester (51% recycled)/5% spandex inverted microgrid thermal lining, the design keeps the fingers together for increased warmth and conforms to the hand for a snug fit. A 3-D silicone palm print maximizes grip; 100% external seam sealing eliminates leaks. All seams are triple glued and internally taped at high-stress areas for durability and strength. Exterior face fabric is stretchy and durable 88% recycled polyester/12% spandex. The natural rubber content is derived from sources that are Forest Stewardship Council certified by the Rainforest Alliance. Made in a Fair Trade Certified facility. 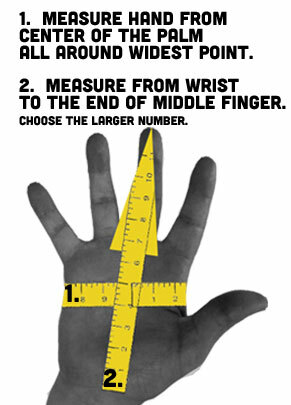 Suggested water temperatures: 32–38° F/0–3° C.
I am a 6ft dude with average size hands and the mediums were really small. I'm an xl. I ha e no idea how they perform in the water yet. The large still had the seams pressing into the tips of my fingers. Not really comfortable. 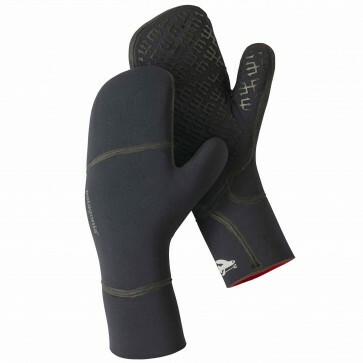 These Patagonia surf gloves are warm and comfortable. I surf in Rhode Island during the winter. My hands and feet normally get cold. In 46 degree F water, I can stay in the water for over 2 hours. I am a 5' 4" woman, 125 pounds and the size small gloves are a perfect fit.